When did grocery shopping become so much of a pain? I honestly can't remember the last time I had an enjoyable trip to Target. Between the tiny humans screaming bloody murder and the picked over produce, I just want to turn around and run out of the store as quickly possible. Then again, that's what I get for trying to grocery shop on the weekend. All I can say is thank goodness for Starbucks! I try and cook dinner at home Monday-Friday. The weekends are when we like to go out on the town. It's amazing how much money you can save by cooking dinner at home! That's all fine and dandy, but I felt like I was making the same things over and over again. Don't get me wrong, there is nothing wrong with having your signature dishes but no one wants to eat it four + times a month. Unless it's tacos or pizza, I could have those two things every single day and be totally cool with that. Ruth, one of my coworkers, told me about Hello Fresh at the end of June. What a great idea! A box of food that comes to your doorstep with recipes included? Sign me up! I did a lot of creeping to decide which subscription box was best for Jered and me. Hello Fresh just seemed to have the more adventurous menu to choose from. Each week you have five different recipes to look over. You decide what three meals sound the best, and a week later they appear at your door. I alway try and pick one chicken, one beef or pork, and one vegetarian dish. 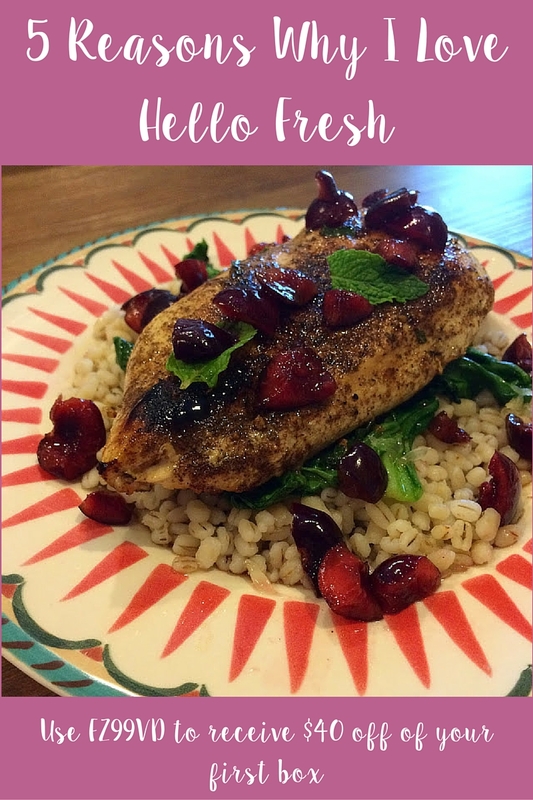 If you would like to give Hello Fresh a try, I have a coupon code just for you. Use FZ99VD to receive $40 off of your first box. Bon appétite my friends!